Along with the new G Master lenses, we got the chance to see the Sony a6300 at the recent European Press Event in Amsterdam. Unfortunately it was only a pre-production model so we couldn’t take any pictures with it. 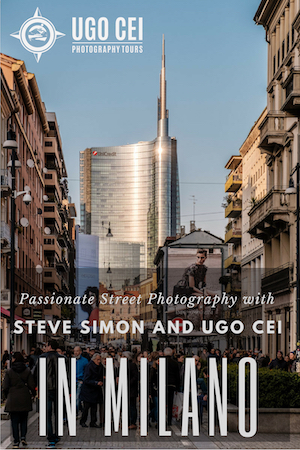 However you can check out some official image samples on our Mirrorless Curation blog. I won’t make this article too long since there are only a few things I was able to check out. Sony asked us not to leave the conference room with the camera so as you can imagine, testing was quite limited. I summarised all my thoughts in the hands-on video below. Further down, I’ll share the most interesting aspects of this camera. 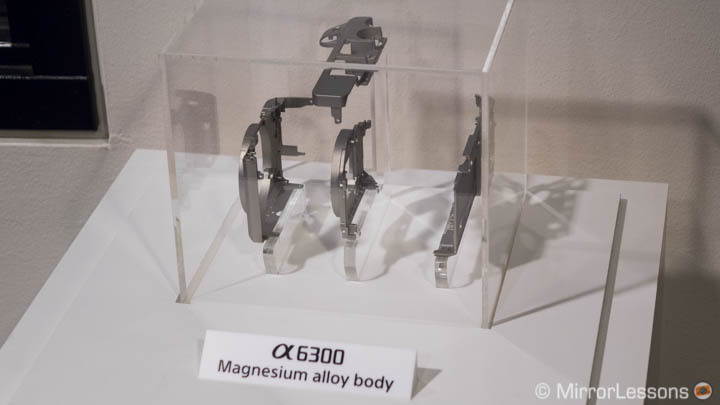 New 24MP sensor: thanks to a thinner copper wiring, it can gather more light in comparison to the sensor of the a6000. The ISO sensitivity has been raised by 1Ev to 51200. 4K video: the camera can record with full pixel readout without pixel binning. To do so it uses 20MP out of the 24MP which corresponds to 6k resolution, then downscales the footage to 4K. It can also shoot at 120fps in Full HD and includes the S-log2 and S-log3 gamma curves. There is a Mic input but no headphone output. 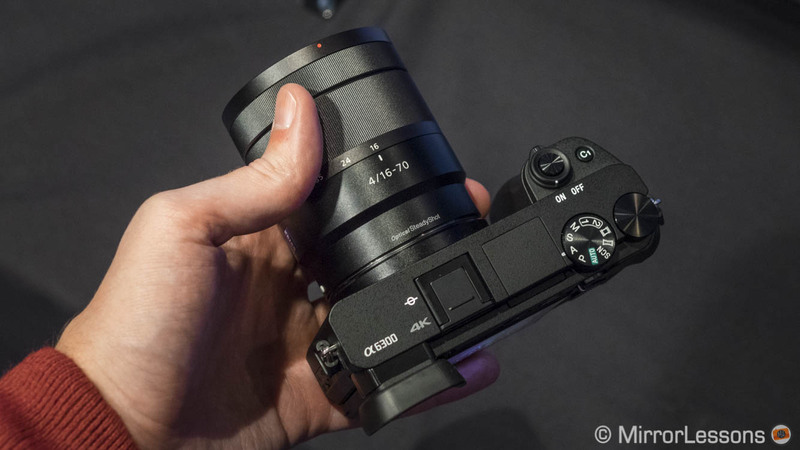 On the outside, the camera looks almost exactly the same as the a6000 except for a few buttons. The front grip has been sligthly re-designed although the difference is not immediately visible. The build quality has been improved to feature an updated magnesium alloy body and a stronger mount. The camera is dust and moisture resistant but not completely weather sealed. Overall the feeling hasn’t really changed from the original a6000. The body is compact and very light, yet thanks to the front grip, it is also very comfortable to use. 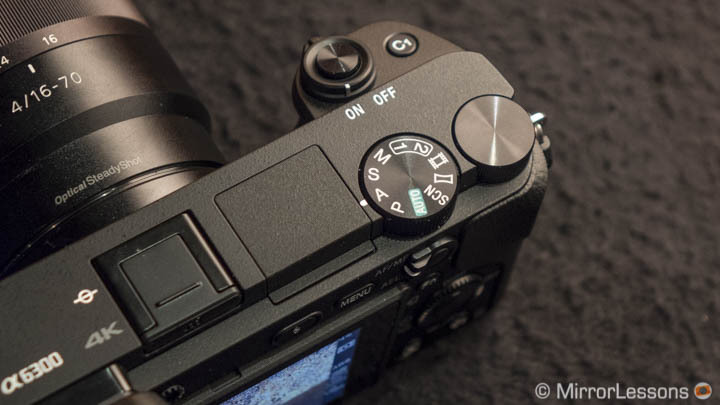 The only complaint I can think of is that an extra dial on the front grip would have been a welcome addition especially considering the action/sports target this camera has. I would have also gotten rid of the built-in flash and provided a small external flash unit as a replacement to make extra space for a third dial on top. 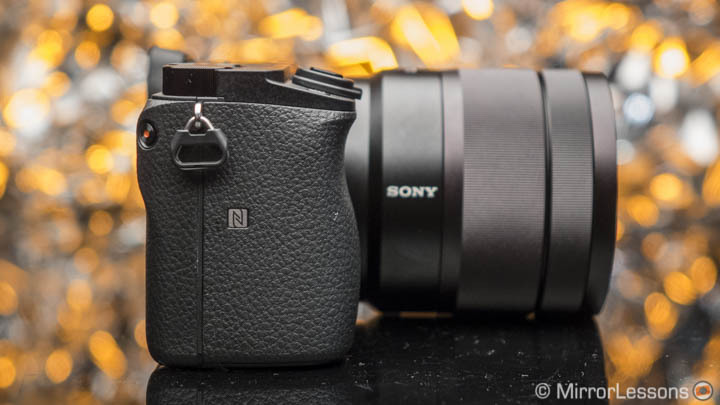 As I already shared in our news article, the EVF is one of the most interesting elements in my opinion. First, after the downgrade on the a6000, a decent resolution is back with 2.4 million dots. The EVF was a pleasant surprise overall. Despite not being very large (0.39in) I find it extremely bright and comfortable thanks to the eyepiece. Then there is the uninterrupted live-view in continuous shooting mode when you select the Hi speed (8fps). It works on both the LCD screen and the EVF. As you can see in the video above, there are barely any full blackouts between the frames. This allows you to keep constant visibility of the subject you are tracking. The lag time response seemed excellent as well. You also have the option of 50fps or 100fps (60fps or 120fps in NTSC) for the refresh rate of the EVF. An example of the continuous live view at 8fps. The screen goes darker but doesn’t black out. Personally I am really curious to test this for some sports and bird photography. One of the negative aspects of an electronic viewfinder is that it doesn’t show you a real continuous live view in continuous shooting mode but rather a slower frame rate. The lag time becomes more important and you can also get full blackouts which further enhance the problem. 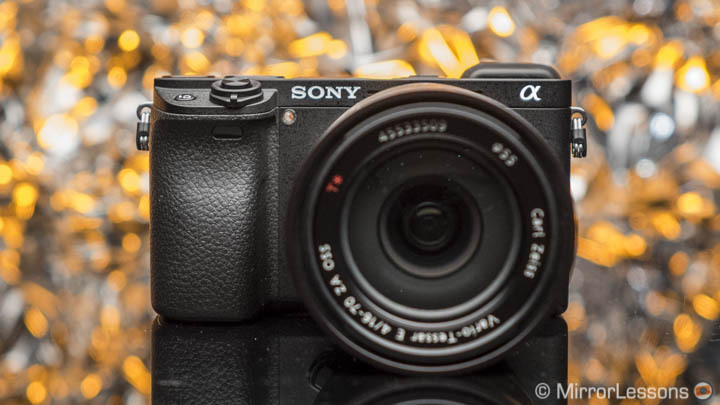 If Sony has found a way to minimise or fix these limitations completely, the Sony a6300 could be the first mirrorless camera with an EVF that matches DSLRs and optical viewfinders. 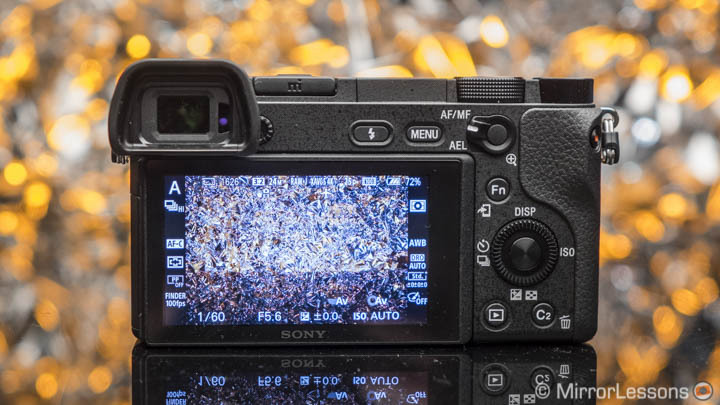 The a6300 has 425 phase detection points and 169 contrast detection points and becomes the mirrorless camera with the most number of focus points. Sony also claims to have improved the response time from 0.06s to 0.05s. To be honest I didn’t find the camera much faster in comparison to the a6000. However I had a good impression about the new High-Density tracking feature. It concentrates more AF points on the subject once the camera detects it. It does seem to be very fast and to detect subjects easily even in low-light conditions. Because of the phase detection points, the camera is compatible with A-mount lenses. Instead of the more expensive LA-EA4 adaptor, you can use the LA-EA3 which is also smaller. I tried it briefly with the 70-200mm f/2.8 A-mount. The speed wasn’t bad at all and reminded me of the A7r II’s performance with A-mount lenses. The only thing to take into account is that the a6300 is really a compact camera. It becomes quite unbalanced with such a heavy and bulky lens. That being said, the performance is very promising and it is compatible with any E or A mount lens. I am also curious to see if the focus accuracy at 11fps or 8fps has been improved. 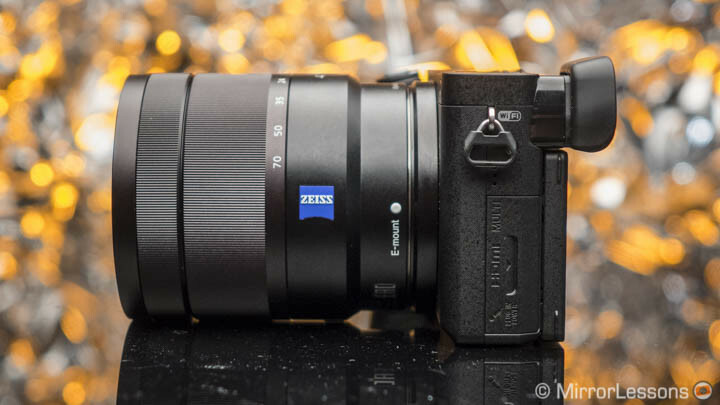 If that’s the case, the a6300 could potentially become the best mirrorless camera for sports. During the press conference, Sony shared some interesting stats concerning the European market. First, Sony’s digital imaging department saw a growth of almost 25% in the last two years. Sony is number one in the compact/travel camera segment thanks to the RX series with a 33% share. Even more interesting is the full-frame segment where they saw a growth from 13 to 23% in the last year and a half. Furthermore in some countries like Germany and Denmark, they have been number one in sales for the last few months, outperforming Canon and Nikon. It seems that Sony’s aggressive strategy is working. It will be interesting to see if these sales will keep increasing and how the situation is worldwide. On paper the Sony a6300 looks promising and after playing around with it for a couple of hours, I can’t wait to put it through its paces. The only things that detract from its potential are the E-mount lenses. Some of the most interesting lenses have been designed for full-frame cameras and will be expensive (I’m thinking of the new 70-200mm f/2.8 GM especially). The only affordable professional telephoto lens for this camera is the FE 70-200mm f/4 and its compact size fits the small camera better. If you want more reach and can’t afford the new 2.8 telephoto lens, the only solution is the A-mount lenses which are heavy and large for such a camera. I understand that Sony is concentrating its efforts on full-frame mirrorless lenses given all the A7 cameras it has released. However, with the exception of a few lenses, I find the APS-C line-up lacks a more complete offering. 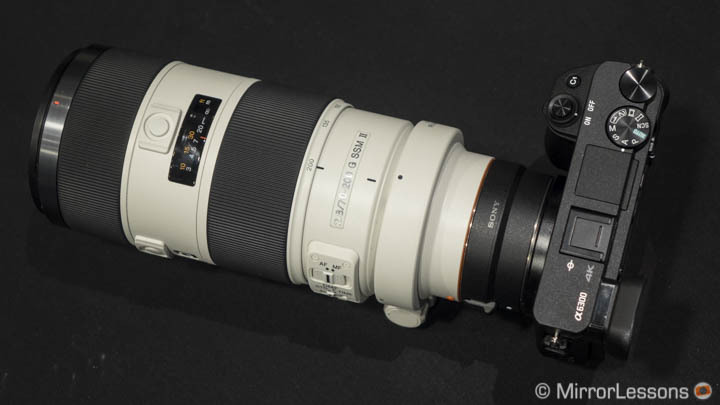 If the a6300 proves successful, I hope they will release some interesting APS-C lenses as well. 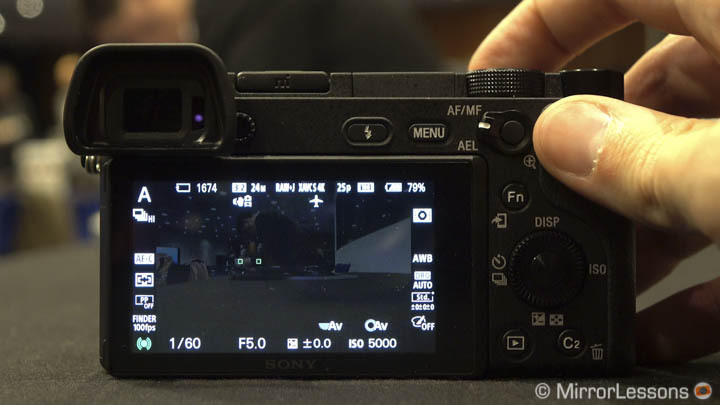 The a6300 will be available in March at the price of $1000, £1000 or €1250. It will also be available with the 16-50mm or 16-70mm f/4 kit lenses. 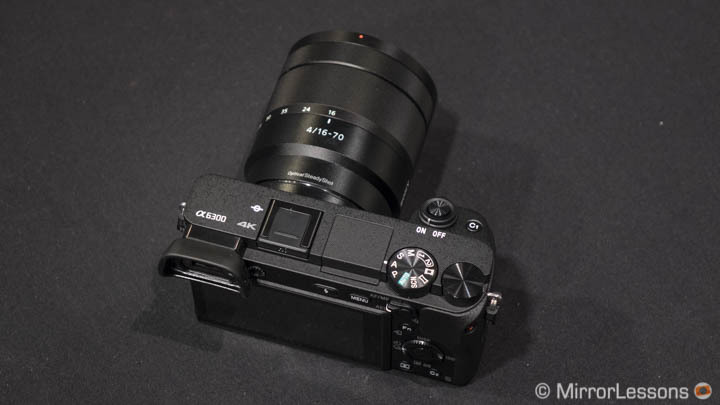 It doesn’t replace the a6000 but is positioned in a higher segment.